Party favors for kid are an expected and fun treat for the kids at a birthday party. Traditionally favors are handed out at the end of a party as a "thank you for coming" before the fun ends. Goody bags typically have a few different party favors including toys and candy so that the kids get several fun treats. Favors don’t have to be expensive or elaborate just a small treat for the kids. You should keep in mind your theme when giving out favors. If you are throwing a cars party include car related favors such as a Hot Wheels car or car coloring book. In addition to being a nice treat, party favors for kids also serve as a great way to thank your guests for attending and show them your appreciation. Here are some suggestions of items to put in your party favor bags that kids will love. A music CD that is in keeping with your theme is a fun idea. For example, if you are throwing a Mickey Mouse party than a CD of Mickey Mouse music would be a good idea. Or a CD of your child’s favorite songs would be fun. But truthfully kids love music so a CD of any kid’s music is sure to be a hit. Favor boxes are an easy way to provide party favors for kids. When throwing a theme party these favor boxes are convenient, cute, match your theme and are lots of fun. And most importantly kids love them. You may want to add some candy if the boxes don’t include candy (kids will expect it). Other than that favor boxes have everything you need. 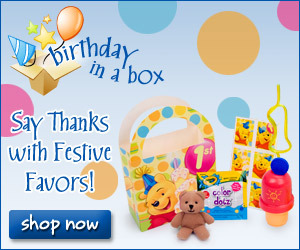 You can probably purchase favor boxes at your local party store but if not then most online party stores have favor boxes. A craft party favor serves 2 purposes; it provides a favor for the kids as well as an activity at the party. Have the children do a craft and then take their creation home as a favor. Some fun craft party favor ideas are decorating picture frames, making bead jewelry, decorating cookies, decorating head bands, making juice box dolls, making pet rocks, decorating t-shirts to name a few. Believe it or not kids love getting coupons to their favorite spots. Not only does a coupon build up the anticipation of knowing that they will be going to their favorite store or restaurant soon but they also feel grown up when they use the coupon. Kids tend to love getting coupons to McDonalds, Dairy Queen, Baskin Robbins, Cups, Burger King and Carvel. A sweet treat is always a hit with kids. Kids love sweets so they’ll be super excited if they get an extra special treat such as a huge cookie, decorative and fun cupcakes or lollipops shaped like their favorite animated character. You can also make an activity out of this favor by baking the treats ahead of time, but leaving the decorating to the kids. Either way the kids will love these sweet treats. Giving story books as a favor will please the kids as well as their parents. Provide books that match your theme. The kids will love taking home a book featuring their favorite characters and parents always think an educational gift is an excellent idea. A typical goody bag at a kids party consists of several small toys and candy, but if you want a more unique favor than 1 big favor will be a surprise for your guests. Instead of several small items spend the same money on 1 bigger gift such as a stuffed animal that matches your theme, a Barbie doll for a Barbie party, a Disney Car at a Cars Party, or a DVD that matches your theme. These favors cost more than your typical favor but you are only buying 1 favor per child not multiple smaller favors. And remember eBay is your friend.